Karina Bisch is a French artist (and good friend) who we’ve had the pleasure to collaborate with several times. Since 2010, we have been working (on-and-off) on the lettering (and accompanying printed matter) of Kiosk, a public sculpture that Karina created for the city of Lyon (a sculpture that is being constructed right as we write this, and will be finished later this year). The graphic items we designed for Kiosk will be shown elsewhere on this website, as soon as that project ready; but right now, we want to write something about a much smaller item we designed for Karina: the logotype for Painting for Living. 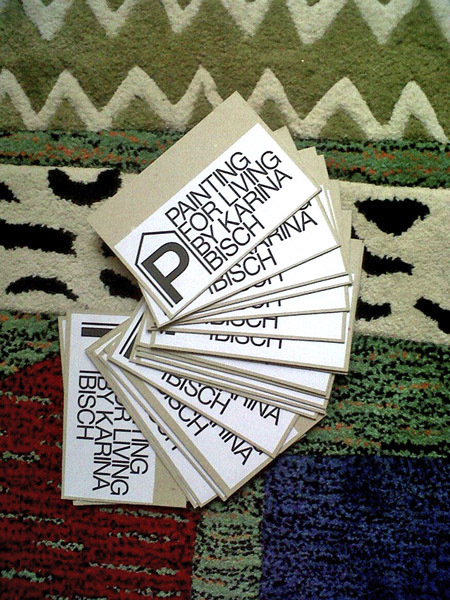 In short, Karina Bisch asked us to come up with a sign or mark for Painting for Living (PFL), an ongoing project in which Karina explores the notion of ‘applied art’. Within that context, PFL serves as a label, through which Karina releases hand-crafted items, such as scarfs and necklaces. We have to admit – we find designing for friends terribly difficult (in fact, when teaching, one of the things we often say to students is simply to never design for friends or family). Having said that, it’s almost impossible to refuse a friend’s request. So when Karina asked us to come up with a quick logo for PFL, something that could be used a stamp or as a label, we couldn’t say no – in fact, we immediately said yes, after which we immediately felt too paralyzed to actually design something. That all changed when, one night, we were wandering through Amsterdam, and came across a traffic sign that depicted a symbol for ‘indoor parking’: a letter P, with a roof on top of it. We immediately realized this was a sign we could use. The letter P referred to the word ‘painting’, the roof represented the idea of living. It all came together perfectly. Added to that, it was a very recognizable icon, something that would fit perfectly on a stamp, or a sticker, or a badge. Moreover, we liked the notion of using a ready-made, found object as a sign, thus creating an ‘objet trouvé’, or better said, a ‘logo trouvé’. Thanks to Karina Bisch, and to the traffic sign we stumbled across during that nocturnal walk through Amsterdam. Do check out Karina’s page for Painting for Living on Facebook.